Our time together is an opportunity to dwell in the refuges of Buddha, Dharma, and Sangha. It is a rare chance to practice together as an LGBTIQ community with the shared aspiration to wake up individually as well as collectively through the practice of mindful speech and presence and to cultivate mutual respect in exploring our identity as LGBTIQ people in the light of the dharma, across multiple and intersecting lines of difference that include, but are not limited to: sexuality, gender, race, ethnicity, socio-economic class, religious or spiritual beliefs, political affiliation, age, size, abilities, and immigration status. May this space be a rich opportunity to be seen, heard, honored, and respected in ways we may not always feel in the world. 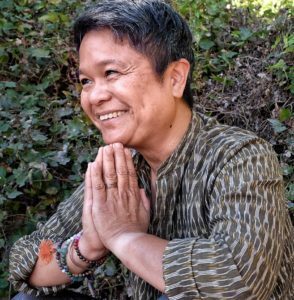 And from this place, may we leave feeling more inspired and empowered to embody and fully express our true and whole selves for the benefit and awakening of all beings everywhere to their true nature and freedom. There will be guided meditation instructions, guided heart practices, group meetings, mindful movement, dharma talks, and interactive practices to deepen our sense of sangha together even as we hold noble silence.